In this day and age, mobile games have become a part of our lives whether we like it or not. Although not as sophisticated or polished as consoles and computer games, they do provide a lot of fun and sometimes, great game-play. Plus, I am sure all of you have phones. Today I will be going through a mobile game that I find to be close to heart for an old school gamer like me, who loves turn-based games, namely, FINAL FANTASY. This mobile game, however, goes way beyond that and spices it up by putting STAR WARS into the mix. That’s right, I’m not crazy and you are not crazy for reading it, the mobile game I am talking about is Star Wars: Galaxy of Heroes. It is a mobile game that is available both on Android Google Play and the Apple Store. Like the early games of Final Fantasy, Galaxy of Heroes is a game with a turn-based system where the characters take turns in order of their speed. A character with the fastest speed will move first, followed by a character with the second fastest, and it goes on til the last character. Regardless if it is your character or your opponent’s character, the turn is determined by the speed of a character. 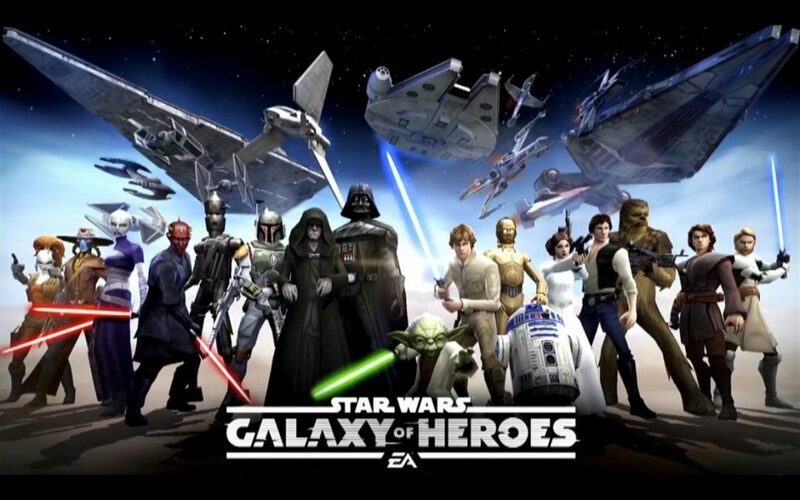 Like most mobile games, Galaxy of Heroes is a free-to-play game with in-game purchases to hasten your progress in the game. The game content is free per se, as every bit of content is unlockable by grinding through the game. However, it takes a long period of time unless you use real money to unlock things faster. The game is occasionally kind enough to give out certain upgrades and characters for free to help you out. The best part of playing the game is unlocking characters or Toons by collecting shards of the certain Toon you want to unlock. Some Toons like a Jawa might require 25 shards while some Toons like Darth Sidious will require 80 shards to unlock. The hard part is that unlocking Toons won’t stop the grind as you will require more Toon shards to further upgrade the character to a full 7 star for it to be powerful. The game of course offers a variety of methods to playthrough from the Light Side and the Dark Side game, to an Arena, and even Guild Raids. One of the challenging game modes available is the Galactic Wars which is unlocked when your account level reaches Level 40. In Galactic Wars, you will bring in your favourite, most powerful team of Toons to fight other Toons generated randomly from other players’ teams to gain rewards like in-game currency, Gears for your Toons, Ability Materials and some currency to buy shards. 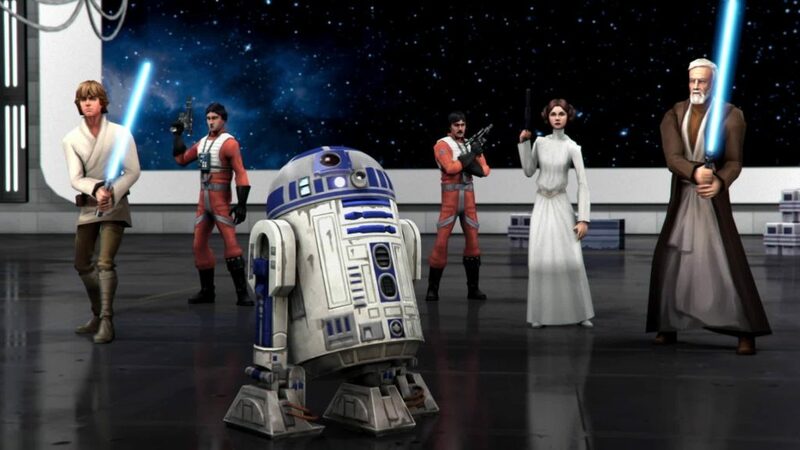 Not lacking behind, the game constantly updates in order to provide more new Toons following current Star Wars movies and cartoon series, as well as provide newer contents to challenge players. The game provides deep gameplay and a large number of things to do including unlocking the variety of Toons the game provides. Each Toon has its own speciality, synergies and abilities, which provides a mixture of strategies when playing Arena or Galactic Wars. Putting together the perfect team of five Toons that you like and nurtured from the start of the game is, in its own way, rewarding. 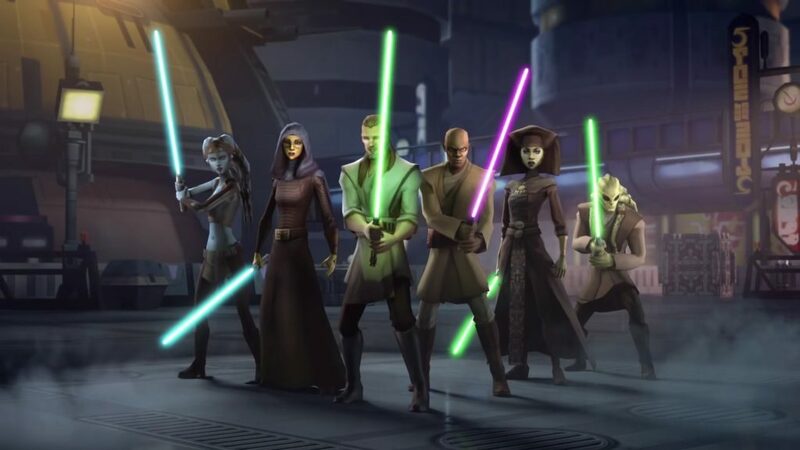 You can put together a team of Phoenix, Rebels, Jedis, Siths, Clones and even Droids, each with their own capabilities and synergies. On top of that, the developers have added Ship Toons where certain pilots can bring their famous ships into battle in the stars. Seeing your team of ships fighting side by side with your capital ship is a lot of fun. There is also a lot of Guild content added like Territory Wars and Territory Battles, as well as Raiding against the Sith Triumvirate. The game however can be a grind as farming for Toon shards is by chance and not a guaranteed drop. This means that it will take a while before you can get a Toon to max stars, not to mention a whole Team to max. However, the game does have a lot of content and avenues to gain Toon shards so that the grind doesn’t feel so long that you lose interest in the game. Furthermore, each Toon has fixed equipable Gears that can be upgraded each up to a max of Equipment level 12 (subject to increase in the future)/ Similar to Toon shards, the gear drops are also by chance and not a guaranteed drop. These Gears are essential as they not only provides a status boost to the Toons, it also further unlocks more skills. Thus, you can see how the game can get grindy when you want tomax out your favourite Toons or Teams. Still, with that being said, Galaxy of Heroes has tremendous amounts of content and Toons that the game will provide both amusement and diversion during your commute. Not only that, being able to see Darth Vader, Luke Skywalker and Leia Organa fighting side by side as father and children is amusing. 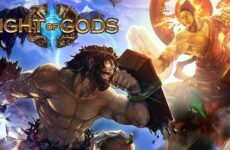 The developer has lately been more open in their communication and promises a lot more content for the game even though 4 years has passed since its initial launch. Personally, I highly recommend this game not only for the love of Star Wars but also because it provides great gameplay, hours of entertainment and a sense of achievement. Go download the game and hopefully you will have as much fun as I did seeing Ben Kenobi and Luke Skywalker fighting side by side like in the New Hope. Until next time, keep slinging those spells. 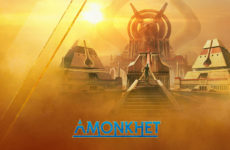 Next PostDigital Card Games In 2019 – Time For An Update!